When it comes to family-friendly fall fun, the Chippewa Valley has it covered. There’s a whole range of activities, from the classic apple picking, pumpkin carving, and corn mazes, to the not-so-classic apple slinging and pumpkin launching. So go ahead, try some cider, stab a pumpkin, and embrace all fall has to offer (because it’s only around for so long). 18444 Co. Hwy OO, Chippewa Falls • 723-0133 • This is a family-owned, pick-your-own orchard of over 6,000 apple trees, located on a ridge overlooking the Chippewa River Valley. The orchard shop offers jams and jellies, crafts, pottery, soap, and other gifts. The on-site bakery serves up pies, turnovers, and cookies. Some of their apple varieties include McIntosh, Cortland, Honeygold, Pristine, Redfree, Viking, Zestar, and Honeycrisp. School tours available. Open everyday 9am-6pm through October. 5198 Sunset View Drive, Eau Claire • 834-9060 • This is a great little mom-n-pop, pick-your-own orchard featuring a scenic view. Gourmet jams and jellies, applewood chips, and eight varieties of apples including Duchess and Connell Red are all for sale. Extremely reasonable prices. Open Saturdays and Sundays, noon to 5pm, through October. Class apple is a member of the new Chippewa Valley Eco Apple Network. 19372 Co. Hwy OO, Chippewa Falls • 723-5119 • Connell’s grows 27 varieties of apples. Besides the ready-picked apples, they sell apple cider, baked goods, gift baskets, honey, jams and jellies, maple syrup, popcorn, pumpkins (in season), homemade ice cream, and 40 varieties of salsa. The on-site bakery specializes in apple pie. They’ve even got fall mums for sale. On the weekend, check out the wagon rides and the free petting zoo. Open everyday 9am-6pm, through November. 6470 Balsam Road, Eau Claire • 839-8370 • www.eauclaireorchards.com • ECO grows most apple varieties, plus pears, sweet corn, pumpkins, Indian corn, and winter squash. Try out their apple slingshot and send fruit soaring into the air over 175 feet at about 50mph. Old Haunted Barn open on weekends in October. There are lots of photo opportunities at the pumpkin house and fun character cutouts. Don’t miss the corn maze, inflatable castle, pumpkin checkers, or bean bag toss. Small kids can have a blast on the new Apple Train. Pick your own apples and/or pumpkins. Tractor wagon rides take you out into the orchard. Open Monday-Saturday 10am-6pm, Sundays 10am-5pm. E6198 Hickory Road, Eau Claire • 878-4526 • www.apples4u.com • At Hillview, you’ll find ready-picked apples, country crafts, pumpkins, and squash for sale. Make sure you stroll the scenic nature trail and the kid’s playground. On the weekends, horse-drawn wagon rides tour the countryside. Pick-your-own apple season is from September through October. Open Thursday–Sunday, 11am-6pm. Corner of County Hwy J & County Hwy K, Chippewa Falls • 720-1663 • www.autumnharvestwinery.com • The McIlquhams offer visitors 17 varieties of fresh-picked apples, including Honeycrisp. Visitors to the Autumn Harvest Winery tasting room can enjoy complimentary sips of apple, fruit, and grape wines produced and bottled on-site. (They’ve even got gourmet food samples.) Season permitting, apple cider and hard cider are also available. The gift shop offers McIlquham Orchard jams, preserves, and apple butters. Enjoy the beautiful patio and picnic areas, as well as a new bakery kiosk with apple treats, fruit tea smoothies, and crepes. In season, pick-your-own pumpkins are available and at the end of the season pick-your-own apples as well. They’ve even got a free corn maze. Open everyday 9am-6pm through Halloween. 1726 County Hwy K, Chippewa Falls • 723-8865 • Schaefer’s is a certified organic orchard offering fresh-picked and pick-your-own McIntosh, Cortland, Connell Red, Harla Red, Honeycrisp, Honeygold and Wealthy apples. Starting in late September, the orchard is open Thursday-Sunday 10am-6pm. W2369 Maple Road, Eau Claire • 834-0998 • A small, boutique orchard White Oak offers fresh-picked Honey crisp, Connell Reds, and Red Cortland apples. Their little retail shop sells crafts, jams, honey, maple syrup, a variety of fruit butters, caramel, mums, and more. Feel free to pack a lunch and stage a picnic in one of their many relaxing areas. White Oak is a major supplier of farm market Honey Crisp south of Eau Claire. 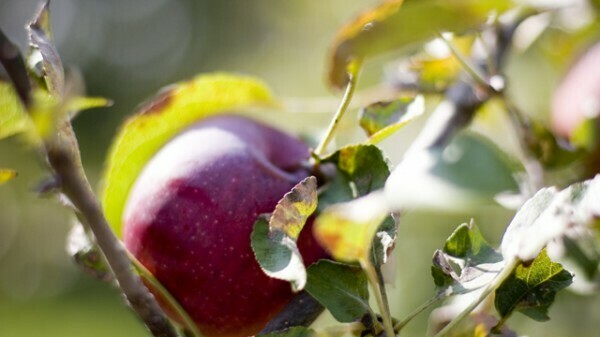 Visitors on opening day can enjoy the Apples & Art Tour, where local artisans have been invited to showcase their wares and tours of the orchard and surrounding orchards are available. Starting on Sept. 18, they’re open Fri.-Sun. 10am-6pm.